“We’re not going to take it anymore….” was the chant heard through the halls of the West Virginia State Capitol in Charleston, WV, in February 2018. 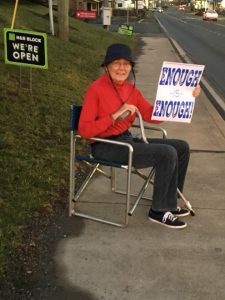 Yvonne, “putting her money where her mouth is,” as she is so fond of saying, waved a sign around in her home county and showed up a couple of times in Charleston also. She loves making sure her voice is heard, and since Bronwyn (Jo) is a teacher, this was a great opportunity to do so. Teacher strikes and work stoppages have been happening across the United States as the lowest paid professionals (many with more years of education than lawyers and salaries that barely approach half that of what lawyers can make) begin to say “Enough is enough.” There is a labor movement transformation happening across the United States. Glad you asked! In this instance, not only do minimum wage employees not make a living wage, often working multiple jobs or living in locations that do not meet even minimal needs, many teachers struggle to make ends meet. In West Virginia, when state employee annual salaries can be less than what our elected representatives make for a 60-day legislative session, many suggested it was time to re-assess. Teachers in West Virginia started the work stoppage to represent not just teachers, but correctional officers, state employees, service personnel and a host of other state employees whose salaries are regulated by the Legislature. Most of our state employee colleagues were not allowed to strike. The motivating factor was equitable health care for all. And after nearly two weeks of a work stoppage led by teachers and service personnel, a task force was put in place to correct the health care issues facing all state employees (including retirees — many of whom have to work in order to pay their rising state employee retiree health care premiums). 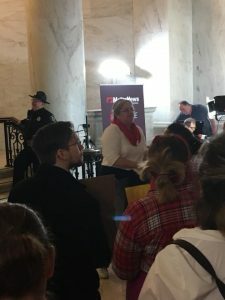 Teachers, and service personnel walked out to benefit over 200,000 people in West Virginia held hostage by pay that does not keep up with inflation and rising health care costs. We looked to help everyone. Can you see why Yvonne wanted to support that? Some media outlets then reported that children were being harmed because they were not receiving food that they might get during the regular school day. Jo worked with local churches and food banks taking donations and offering to deliver meals on any given day of the work stoppage. Most of the local churches were well organized, but when “harm” was mentioned, that “harm” was acted against by people who want what is best for children. Exhausted state employees, exhausted state police, exhausted correctional officers, exhausted teachers from working two or more jobs is not what is best for our children. And those people also saw that missing meals might not be what is best for West Virginia’s children, so they worked hard to feed them too. Jo/Bronwyn in front of the entrance to the West Virginia State Senate, February 2018, making a joyful noise. a shell to grow a new one. This change is not easy, but it usually invites growth into our lives. Walking out of your job, even to benefit 10 times the number of people you work with is some scary stuff. Let’s be real. It’s not for the faint-hearted. Making national news while leading chants and having the Capitol Police stand near you, just in case, that makes it real. It’s also one of the great leadership tasks of the Pagan community. Many Pagan leaders have marched, stood their ground for their values, and sometimes, have gone to jail while participating in passive resistance. This was not Yvonne’s first rodeo, nor mine. However, is change happening in West Virginia? Absolutely. And, we, as people who value and live the Rede, did our best to push for the common good. Was this experience personally transformative? Not really, but I could see our actions changing lives all around us. For many of my friends, it was the biggest thing they had ever done. To know, not only that they were helping 6% of the state and their families was empowering, to see my friends’ faces as they realized their own fierceness and courage. It was wonderful to see spirits soar in courage and unity. To know that West Virginia’s teachers have opened doors for teachers in other states is tremendously empowering for my colleagues. It may have to happen again, but if it does, it will be less frightening. At the tail end of Mercury Retrograde, experiencing another New Moon, looking at what that means for all of us. Is change done? Probably not, if the latest news is any indications. Do we, in the Northern Hemisphere, have new hope as spring is trying to get sprung?!? I hope you are swiftly recovering from Mercury Retrograde (mine was pretty tough, guys) and embracing that New Moon energy. How did you change through the past couple of months? Say “good-bye” to that old you. Stop clinging to old paradigms, or living in your tunnel (the next blog, for sure). You don’t have to dye your hair purple, or earthy colors for Beltane as it swiftly approaches, but you do have to embrace your personal power. Where does your personal courage lie? It does NOT have to be on a national stage! It can be in taking care of abandoned animals, or speaking your truth in difficult situations, or even knowing that there are times when you need to be quiet to meditate. Say “good-bye” to your fear, gain your personal power through courage. Let the courage of West Virginia be your guide. Let the courage of Pagan leaders be your guide. Get up and do something incredibly brave for you.